For fifty years now, Sunset Boulevard in Los Angeles has shaped the trends in the entertainment industry. It’s better known as the Sunset Strip, where for a mile and a half you can drive through West Hollywood to Beverly Hills. The road is more than a scenic drive through the city, but it holds history with its punk, hair band, and heavy metal music scenes as well as it’s infamous nightclubs, rock clubs, and restaurants. Many big anniversaries of famous spots have recently passed as The Strip remains a prominent area for developing new talent. The Sunset Strip to this day has people of all ages around the world travel to visit it. This isn’t just because of the homage paid to all the artists that have come out of it. Of course you can’t walk very far without seeing something Mötley Crüe, Guns N Roses, or Van Halen around, but it is the new generation of artists who are striving to keep The Strip alive. Within just a couple blocks some of the most influential venues of all time can be found. The Viper room, The Roxy, and the Whisky-A-Go Go are just a few of the venues still hosting acts. Any type of music you can name, you’ll find a show. Comedy acts, underground grunge, even top 50 pop artists are all playing the venues that once were where music legends could be found playing. 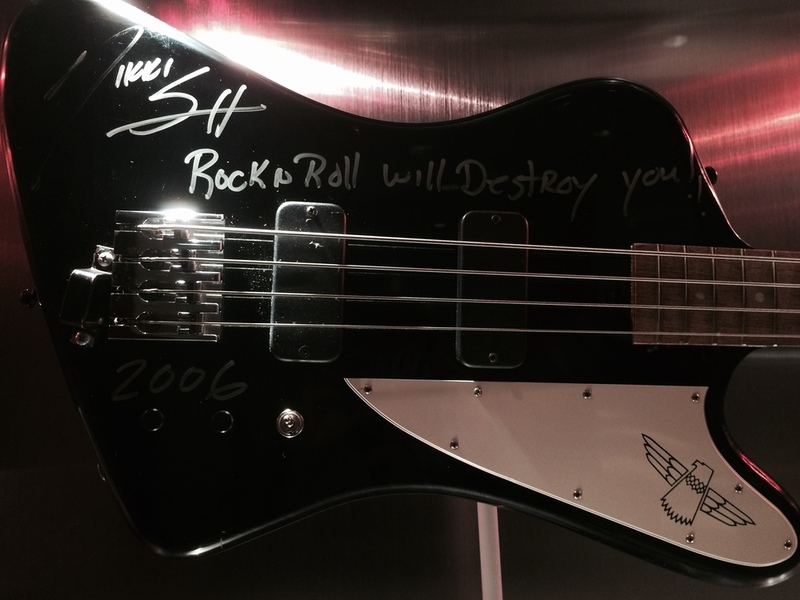 While the signature sound of hard rock still is prominent, newer artist have begun to leave their mark on history. The Strip may be battling globalization and industrialization, but it isn't going down without a fight. The clubs that have stood the test of time are continuing to add new artist to their market to include the newest generation. The Rainbow Room still has much success thanks to Motörhead and the claim to fame being,“It’s Lemmy Killmister’s hangout spot.” Rumor has it that he’s there every week and can be found lurking around in his favorite spot with a bottle of Jack Daniel's in his hand. You never know who you may see inside. Outside the Grille and Bar there’s a deck and full bar always home to a high energy crowd. Hard rock music blast over the loud speakers while people from all over the world gather to have some drinks and tell stories. Proper attire includes black, denim, and as much leather as possible. Inside there’s a more exclusive vibe with the dim, dining room only lit by white icicle lights with the table’s surrounded by round, wrap-around red leather couches. It’s low key, labyrinth atmosphere allows big name artist to join the fun. "First Time I came to the Rainbow, it was like '73. If you've been coming here for awhile, you'll get into it-the ambience, of the place." The walls are completely covered in history with collages and framed images showing the legacy of the restaurant. Rock and roll memorabilia and photos of the hundreds of musicians who have visited line the walls. Photos of teased haired musicians in shredded jeans and scuffed boots, many of which never got their big break have their place in the colleges as well. Other walls show the vast success of artist in the area, with The Who, Led Zeppelin, and Ozzy Osbourne. While the scene may not be party central like it was in the eighties, a certain special type of crowd is still drawn here. As you walk up the stairwell to other floors, you walk through time passing autographed framed photos of forty years of artists. At the top of the stairwell there's the bathroom and a hallway to another bar. In the woman's room, one stall door didn't lock and a woman cautiously walked in and half-joked, “Hey, gotta make sure no one's doing coke in here.” The more times change, the more they stay the same. Upstairs there are more intimate areas to sit and a drop down wooden stage for local artist or any special guest to perform. The final third floor is exclusive to only ‘private’ parties and has this sign posted next to it. Right next door to the Rainbow Room is The Roxy Theatre, which recently celebrated a forty year anniversary after being opened by three guys who wanted to create a venue where all genres of music were welcome. They surely have found success with artist artists such as Billy Joel, Nirvana, Bob Marley, and Prince playing the club since the seventies. In July 1997, Kerrang! released the “100 Greatest Gigs of All Time” and ranked Nirvana’s show at the club on August 15th, 1991 as number one. Shortly after the show, the band handed out flyers for the recording of the Smells Like Teen Spirit music video which also received world recognition. Today, comedy acts and nation-wide tours find themselves playing this club. It’s left such a mark that Genesis, Bruce Springsteen, Bob Marley, and Van Morrison all released live albums recorded here. Just one street over you can find the Whisky A Go Go, opened in 1964. Still hosting local musicians and big name bands, the venue is hanging on after recently celebrating its 50 year anniversary. This was a huge part of Mötley Crüe’s stomping grounds in the 80‘s, but also has been home to Janis Joplin, Jimi Hendrix, Led Zeppelin, and The Doors. "The Whisky was on the forefront of every musical trend including Motown, Rock 'N' Roll, Heavy Metal, Punk and New Wave," says Mikeal Maglieri, son of original Rainbow owner Mario Maglieri, to Los Angeles Independent. "The Whiskey is staying forever -- It's a family business"
Across from all the other venues, The Viper Room opened in 1993. Johnny Depp wanted it to be a new outlet for the up and coming punk scene. The small, intimate club is just a single room that can only hold about 250 people. The 21 and up venue has had world-wide acts play the club and was created to help keep the genuine, working class fans able to see shows and be close to their favorite artists. The venue was part of all the action but following the overdose death of actor River Phoenix on the club’s front sidewalk in 1993, the venue became a dark entity, said to have “evil spirits”. Johnny Depp explained people thought of it as a crazy place until a certain performance. “Once Johnny Cash came in and played in 1994, it was almost a cleansing”. People began to come back and the Pussycat Dolls and Burlesque movements moved in. As the 21st anniversary the venue passed, it’s still the place where being an artist is more than just being a novelty act. Large companies have continued to try to take over parts of The Strip to make more money, but the core groups are holding strong. While all the mighty, historic, and smaller venues have stood the test of time, the House of Blues recently succumbed to this new movement. A giant hotel will replace another venue that used to have a pivotal role in supporting bands. It will never be like how it was between the 60's-90's, but it's time for another music revolution to come. These clubs proved there is still a market for music and that there still is hope for the original strip to stay intact. The Strip will continue to mold to what the audiences want, but it will always have its roots, memories, and history in rock n roll.